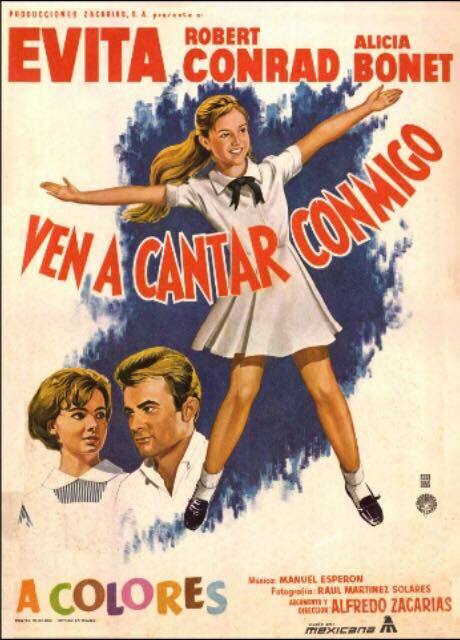 Ven a cantar conmigo was filmed in Jalisco two years after the making of Verano en Guadalajara (1965). Both movies are musical romances that incorporate lots of tourist-alluring footage of markets, ancient buildings and cultural events in Guadalajara and at Lake Chapala. The two movies also share the same lead actor – Robert Conrad – but this is where the similarities end. The storyline of Ven a cantar conmigo is much stronger than the uni-dimensional plot of its predecessor. The central romantic plot line in Ven a cantar conmigo is more nuanced and complex, giving viewers a much more satisfying experience. A splash of adventure in the middle of this film serves as a counterpoint to too much romantic gushiness. The central romance does not unfold without some melodrama towards the end. Ven a cantar conmigo was produced by Miguel Zacarías and written and directed by Alfredo Zacarías. The company behind the movie was Producciones Zacarías S.A. The cinematography was by Raúl Martínez Solares. The film was first released in Mexico on 19 October 1967. The three major stars in this movie are Robert Conrad, playing an American artist named Bob Seaman, Alicia Bonet playing Aurora, the nurse he falls in love with, and the talented young singer “Evita” (Eva Luisa Aguirre Muñíz), who was eleven years old at the time and plays the role of a precocious orphan, living at the Hospicio Cabañas, who is a show-stopping, not-to-be-ignored matchmaker. This was the Guadalajara-born youngster’s first movie. She subsequently enjoyed a stellar, though short-lived, career as a singer, actress and T.V. presenter before retiring from show business in her early twenties. Given that the opening credits thank the Jalisco state governor, Francisco Medina Ascencio, for his support, it is not surprising that many of Guadalajara’s most important tourist attractions form the backdrop to scenes in the story. The photographs of the Hospicio Cabañas (now Instituto Cultural Cabañas) and its murals (explained by Evita to a visiting group of tourists) are among the highlights. As a young, charismatic minx, Evita steals the early scenes of the movie. She is quite determined to find a suitable beau for her friend Aurora, a young nurse who grew up in the orphanage and works in a local hospital. Evita and Aurora are shopping in the San Juan market for fruit and vegetables when they bump into a handsome American artist. A misunderstanding leads Aurora to believe that Bob is poor and hungry. In reality he drives a sports car, is staying at a top hotel and is clearly wealthy. He visited the market to purchase single vegetables to compose a still life. When he returns to his hotel to paint, he can’t help drawing a portrait of Aurora instead. Minor misunderstandings continue as he seeks to get to know more about Aurora and to ask her on a date. The process includes, in true Tapatío fashion, Bob hiring mariachis to serenade her at dawn. Before long, accompanied by Evita and one of Bob’s friends, they are all on their way to Lake Chapala for the afternoon. The short section of the movie shot at Chapala shows the beach, the Beer Garden restaurant, the main church and nearby Braniff mansion. The proceedings are enlivened by buying balloons and a game of hopscotch. There are many worse ways to spend your time than watching Ven a cantar conmigo! The entire 87-minute movie is available via Youtube, as is a clip of the short section showing Lake Chapala. Enjoy!